The clothing that you wear matters more when you are in need of dependable performance on the roughest conditions and situations. A tactical jacket provides tactical functionality to fulfill your tactical need on the training or mission. A tactical jackets can be your constant and reliable mate that helps to survive harsh and adverse weather of different environments. Now, these garments also become more popular among typical citizens due to its comfort and durability. You can use these garments to get full support on snow, dry, wet or cold weather. 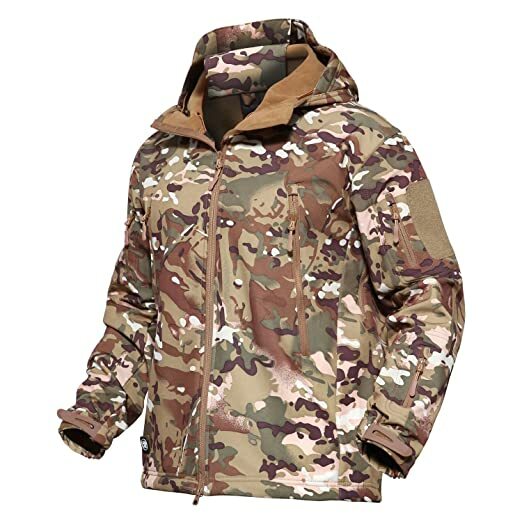 This durable, as well as dependable jackets, are made from tough military grade and cutting-edge materials which can be used for hunting, camping, hiking or paramilitary combat as well. Tactical jackets are suitable for professional, casual or outdoor use. You need to consider several things like the environment, budget, durability, and material to choose the best tactical jackets for you. You may also need to consider the price, size, color, hood, waterproof, windproof and pockets before purchase. This review will help you to pick the perfect one for several jackets. Here we have listed10 best tactical jackets features with their pros and cons. This review will help you to take the right decision that which one is perfect for you. This military jacket by Condor alpha designed for heavy duty and comfort. It is made of 100% polyester, super fine fleece outer shell with oxford reinforce, nylon abrasion-reinforced collar and shoulder and forearm. Its sleeves extend up to two inches. It also contains two four inches velcro loop shoulder patch panel, vertical chest pocket, and two slash hand pockets as well. It works as a three season jacket. It comes with reinforced shoulder and smooth materials down through the chest. This windproof jacket has the full front zipper from collar to bottom and has an adjustable drawstring waistband. It has a variety of colors. It’s easy to wash the jacket and no need to iron or dry clean. We hope It will be your favorite winter wardrobe. 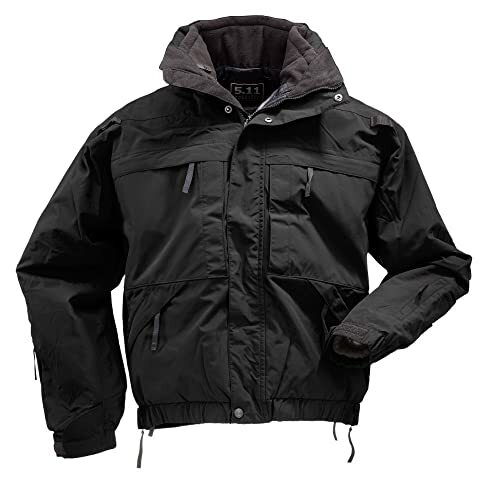 This is an excellent tactical jacket with great fabrics and features. It is 100% quality guaranteed. The free soldier jackets made of DINTEX softshell material for its outer layer and fleece lining for the inner layer. This stylish polyester jacket is suitable for all outing activities. It will protect you from cold, rain and wind. This jacket is waterproof, windproof, lightweight, breathable and warm keeping. It will also prevent bugs when you go hunting. There are multi large pockets in chest, shoulder, and hand. You can carry small weapons, mobile phone, headphone, power bank, and other electronic gadgets in those pockets. This jacket is suitable for camping, hiking, cycling, fishing hunting, mountaineering, and other outdoor activities. It comes in many attractive colors and various sizes to small to big. You can match it with your other dresses too. The zippers of the jackets are water resistant. The collar with a multi-functional hat prevents from wind and getting wet. It has a DIY Velcro patch, so you can paste anything you like. What you want from a tactical jacket I am sure you will get everything in it. 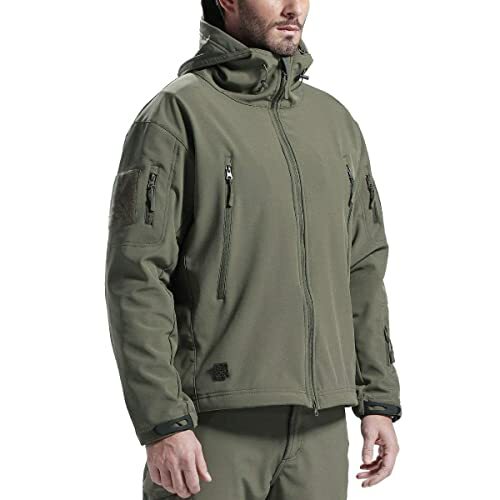 TACVASEN special military soft shell jacket is mainly for outdoor activities. This jacket designed for outdoor sports and other activities. Such as camping, hiking, cycling, fishing hunting, and other outdoor sports. This jacket is affordable in price. The jacket made of 100% polyester and inner soft fleece which is lightweight, breathable and moisture wicking. This waterproof and windproof jacket is quite light and comfortable and comes with a collar hood. The hood and waist have a drawstring and the sleeve cuffs have elastic hook and loop for adjustment. 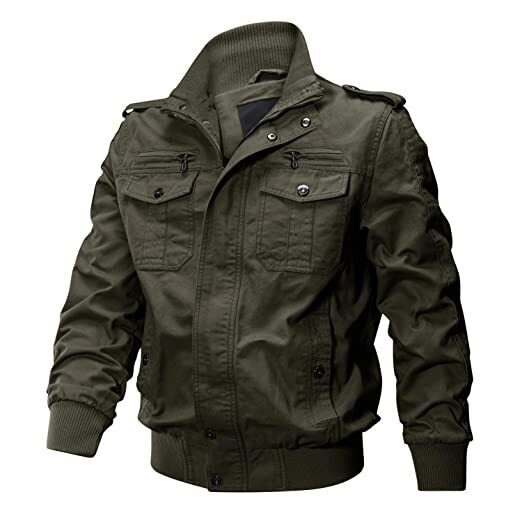 The military jacket has a variety of colors and multi-pockets. You will find two large pockets on chest, smaller pockets on both sleeves, forearm pocket on left arm, two zip pocket on the back and vent zipper under each arm. There are velcro patches on both sleeves. You can paste here military patches and logos easily. The soft shell jacket comes with all features and performs well in different weather. 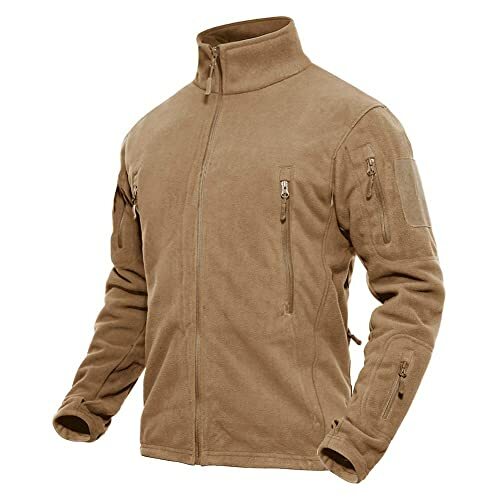 The Magcomsen men’s tactical army jacket is made of shark skin soft shell fabric with a comfortable fleece lining. This jacket comes in eight beautiful colors which will catch your eyes. The army outdoor jacket is waterproof, windproof, breathable and boasting with thermal. This jacket hood is concealed and nondetachable. It has a drawstring cord for hood and waist. You can use it for your perfect size. The Magcomsen softshell jacket has six pockets for extra storage – two high chest pockets, two zipper, back pockets, and two sleeve pockets. You can use a back pocket for carrying a hat, gloves, snacks, and water. The jacket has two velcro strips for personalization. 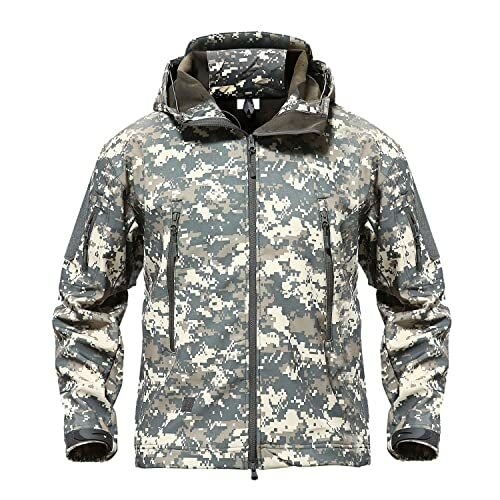 This army jacket is perfect for all outdoor activities such as- hiking, hunting, rafting, camping, fishing, shooting and other outdoor activities. The jacket has vent zipper for each arm. This option makes the jacket more venting and breathable. The cost of the jackets is at a medium range. But you will get better performance than others at the same price. The 5.11 is the world leading tactical jacket manufacturer. 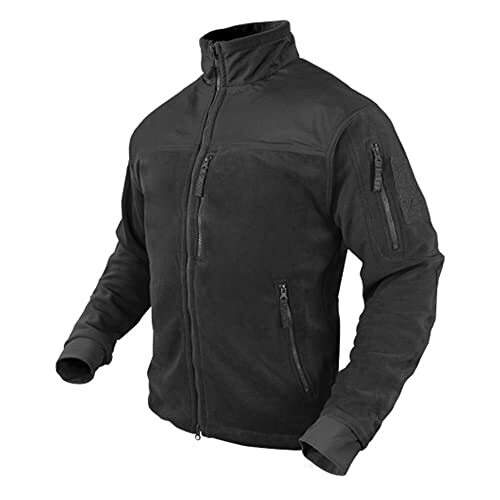 It’s an all-season jacket and assures you high-quality materials, stitching, and insulation. It has become the best choice for military and paramilitary. The five in one jacket is a magnificent all weather jacket solution. Especially in cold or windy weather condition, this jacket will protect you. It is designed for mobility and durability. The inner fleece liner with zip-off sleeves can put on together or separately. Removal liner sleeves of this jacket provide five different garment configurations for maximum adaptability in changing climates. This tactical jacket has a backup belt system for additional backing. The liner offers a hidden document pocket at the chest and zipper hand warmer pockets. The 5.11 jacket has side zippers for ventilation and access to sidearm. This high performance waterproof and breathable patrol shell jacket is resistant to rain and abrasion. It has micro clips at the shoulder where you can keep radio cord secure. You can roll up or remove of this jacket hood. This detachable hood is waterproof. The jacket company uses high-quality YKK zippers, Prym snaps and tactec system compatible lining in this jacket. It also has front and rear ID panel. The 5.11 tactical jacket is the actual value of money. The ReFire Gear is another finest jacket with reasonable price. 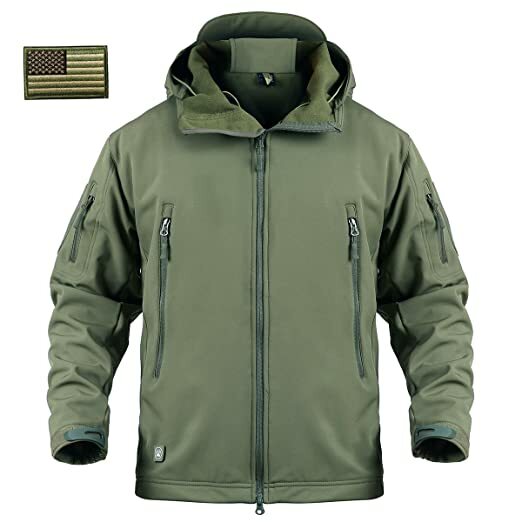 This tactical jacket made with 100% polyester softshell fabric and thermal fleece liner. It keeps you warm and comfortable during winter. 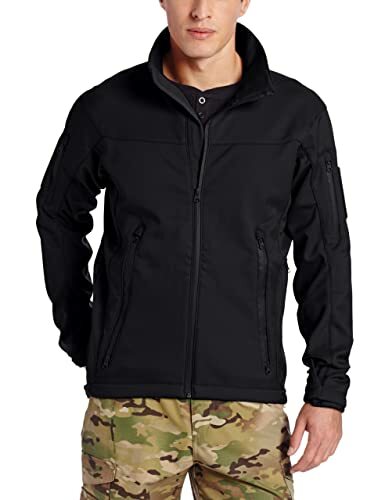 These waterproof and windproof jackets perfect for tactical combat, outdoor sports, traveling, motorcycle, cycling, hiking, climbing, fishing, paintball, airsoft shooting and casual wear. The jacket has a big hood which can be rolled up. The jackets provide a double zipper for extra wind. You get a warm fleece liner with a hook and loop adjustable wrist cuff; drawstring waist and hood. It has large Velcro patches on both arms for your personalization. For extra ventilation, there is vent zipper under the arm. As with other tactical jackets, these jackets have multi pockets. There are seven pockets- two large pockets in the chest, two back pockets, two small pockets in left sleeve and one small pocket on the right sleeve. You can use these pockets for different purposes. You can carry small weapons, electronic gadget, EDC gear equipment, wallet, map, gloves etc. Tru-Spec is one of the leading suppliers of uniforms to military, law enforcement and public safety markets. 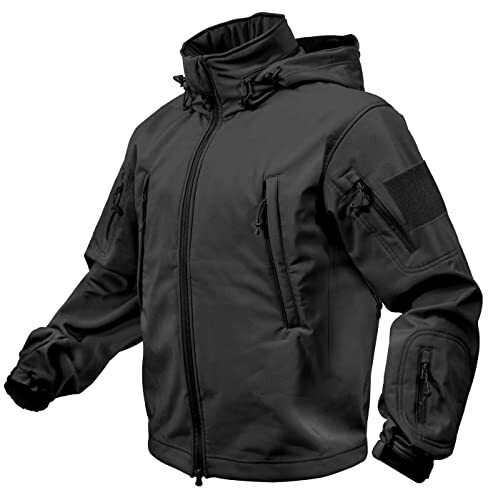 The True Spec tactical softshell jacket made with 90% flexible nylon and 10% spandex material. This water-resistant jacket is highly breathable, lightweight and comfortable. It provides the room for the use of ballistic vest or holstered firearms. Two-way stretch and gusseted underarm design of the jacket gives you mobility. This jacket has no hood but a mandarin collar Velcro cuffs, storm flap waterproof zippers and waist cord which works together to protect you. Combination n of microfleece lining retains heat and wick moisture. The jacket has two front pockets, two sleeve pockets and two rear zipper pockets located on the lower back provide plenty of storage. The front pockets are unique. It’s two-way zipper for access top or bottom of the pocket. The side seam zipper quick access to your weapon. Rothco is the quality supplier of military, tactical, outdoor, survival clothing and gear. The versatile soft shell jacket is made of 100% waterproof polyester shell. It constructed with three breathable layers which protect you from deflects moisture, heat, and wind. The jacket is extremely suitable for indoor and outdoor activities. The jacket has thermal performance in the cold winter. The Rothco special ops soft shell jacket has a fleece liner collar and concealed detachable hood with the cord. This shell jacket has a drawstring waist, elastic hook and loop wrist cuffs for adjustable fitting. There are four by four inches loop field in each shoulder for your comfort. Rothco jackets have multiple pockets. You can keep your important stuff there. It has large pockets in the front and concealed carry pocket in the rear and front. It has a ventilation area underneath your armpits. Besides, this jacket is very stylish within your budget. The CRYSULLY military bomber jacket is very comfortable for its 95% cotton fabrics. The liner of this jacket is 100% polyester. The jacket is not water or windproof. That’s why it is not eligible in cold weather. You can wear it in the spring or fall seasons. The price of the jacket is very affordable. It looks stylish and feels nice. The inside lining is very soft and warm. The jacket with full-length zipper plus snap buttons closure. It has shoulder straps and patch embroidery. The CRYSULLY has an iconic stand-up collar. This jacket has multiple pockets and multiple colors. It has two decorative chest pockets. You can put a very small thing in chest pockets. The military bomber jacket has two hand pockets and inside pocket for your wallet or valuables. You can use this jacket for occasions, casual and outdoor activities. The TACVASEN stand collar military fleece jacket made from polyester. This jacket is inexpensive but warm and comfortable in cold winter. The hoodie is nice with neck zip. You can protect your ear from cold weather. Underneath the neck, there is an extra flap to protect the wind through the zipper. The zipper is on the left with the drawstring. It has long sleeves with little thumb-hole. There is a pen hole in the shoulder. The jackets have lots of pockets. Two of them shoulder pockets which are big enough. You can put there your mobile phone, wallet, maps etc. There is also a forearm little pocket. You can put there a parking pass, id or something. The military fleece jacket has two zip pockets on back. You can use it as a mini backpack. The jacket has bundle unique patch design on both arms. The TACVASEN fleece jacket suitable for hunting, camping, fishing, hiking, traveling and others outdoor activities. There are lots of reason to buy a tactical jacket. First of all, you need to consider- warm, comfortable and durability in winter or any other seasons. Tactical jackets military-grade materials fulfill your all demand. You can buy your favorite tactical jacket from different types, design, quality, and price. You can enjoy your hunting, hiking, camping, fishing, traveling as well as others outdoor activities with a perfect tactical jacket. After reading all the tactical jacket reviews here, we think it will help you to choose your perfect one.